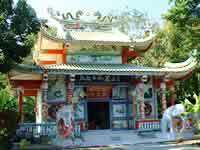 Virtual travel & island guide about the Buddhist Temples on Ko Chang in Thailand. Religion plays a large role in the life of Thai people. Each Thai man should live as monk in a monastery one time in his life for at least 3 months. 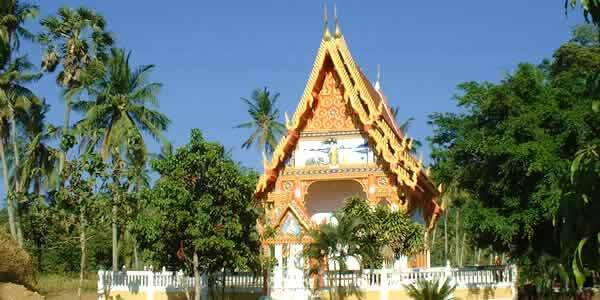 In order to follow his faith, there is at least one Buddhist temple (Wat) in each Thai village. (More informationen about Buddhism & Religion in Thailand: 'Thailand Info', 'Population, Religion, Formation / Educational System & Language in Thailand'). Wat Bang Bao is directly by the road, just beside the turn-off to Baan Bang Bao. Wat Khlong Prao is located in Baan Khlong Prao, also directly off the main road. Wat Khlong Son is approximately 500 metres from the intersection in Baan Khlong Son, in the direction of the bay. Wat Khlong Nonsi is situated just before the Dan-May-Pier in Baan Khlong Nonsi. Turn towards the sea at the intersection on the main road. A further wat is in Baan Salak Phet, directly by the road.